A reliable source for Sonotube information and a resource for accessing leading Sonotube and suppliers. Sonotube® is a registered trademark product of Sonoco, and is an alternative method option for concrete column forming. Columns are fabricated using a reinforced shaping structure, and traditionally steel or fiberglass was used in the process. However, those materials are both heavy and inflexible and require careful treatment. Sonotube Sonotube® is a registered trademark product of Sonoco, and is an alternative method option for concrete column forming. Columns are fabricated using a reinforced shaping structure, and traditionally steel or fiberglass was used in the process. Other uses have been found for Sonotubes® because of their incredible strength-to-weight ratio and cost-efficiency. Sound technicians and sound hobbyists are using Sonotubes® cut vertically in half to improve the acoustics in auditoriums and sanctuaries. They have also been used to construct sound cabinets as the cardboard walls don't absorb the sound waves and so are an ideal material choice. The versatility of Sonotube® is one of its many advantages. When fiberglass or steel column supports are used, the number of columns poured is limited to the equipment on hand. Sonotubes® however are disposable and do not need to be reused, they also do not need added exterior support as fiberglass and steel tubes do. Therefore, the overall construction time is drastically reduced as multiple tubes are able to be poured simultaneously. They are also recyclable. 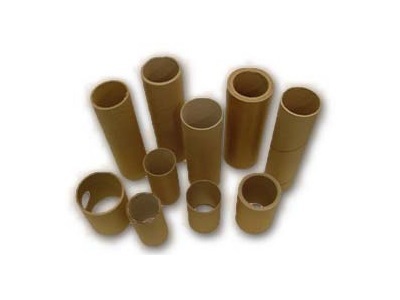 Once the concrete column has set in the paper tube cavity, the outer cardboard layer can be removed and disposed of. They are typically made from biodegradable paper and so depending on the intended use of the column, can be left on or removed whole or in pieces. The tubes are manufactured between 8 to 56 inches in diameter and up to 18 feet long, Sonotubes® offer versatile solutions for almost any concrete project. The pouring of the concrete is fairly straightforward, although for the longer columns, extra machinery may be required to ensure proper placement of the concrete.